Gotica Toscana npa – The GoticaToscana is a non-profit, non-political, Italian military history association; our base is in Scarperia, 30 km north from Florence. Our goal is to record the History and the Memory of events during WWII. Our area is crossed by the famous Gothic Line, It is here that the Allied Army lost so many lives, a significant amount of their equipment, vehicles and a great deal of time. 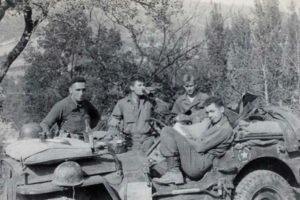 From the historic point of view, the Italian Campaign after June 1944 was a secondary front but for the Italian people and the soldiers involved the campaign was a tough and bitter struggle. Even today, there are a considerable number of German, US and British positions and bunkers still to be seen. Gotica Toscana npa was born in 2006 from a team of enthusiasts and researchers to preserve the memories of the events related to the WW2 in the area of the Gothic Line, the Italian forgotten front after the Normandy landing. Goticatoscana.eu is the web site of “Gotica Toscana” a non-profit, non political, Italian military history association. Our goal is to record the History and the Memory of events during WWII. We have been online since February of 1998. Our area is crossed by the famous Gothic Line, It is here that the Allied Army lost so many lives, a significant amount of their equipment, vehicles and a great deal of time. From the historic point of view, the Italian Campaign was a secondary front but for Italian people and for the soldiers involved the campaign was a tough and bitter struggle. Even today there are a considerable number of German, US and British positions and bunkers still to be seen. Our goal is to keep all WWII military sites accessible, this will enable us to take photographs, carry out historical research and arrange meetings with veterans and their families. It will also help us to keep records of the artifacts we have found including such items as Dog Tags identifying lost soldiers identities. From this background we are able to organise events like “A jump into History – An open air museum” and WWII vehicle rallies and meetings where we can remember and promote our history. Our association was created by collectors and historians to collate as much information as possible and share it with others, thereby stimulating further research and keeping alive the memories of our past.